I love camping! I love planning our menu and cooking while on a camping trip. S’mores are the proverbial camping dessert and I enjoy them but they can be really, really, really messy. I know, that is part of the fun! But sometimes the combination of marshmallow goo, sand, leaves, and the great outdoors is just a little too much for me. I thought up this yummy treat as an alternate option for our family in hopes that it will help cut back on some of the mess. 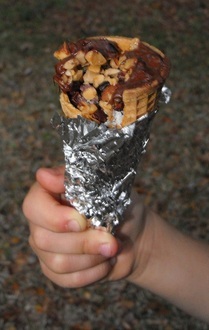 You have two choices for when to make these–you can assemble everything, wrap the whole thing in foil, and then just pull it out and place it on the campfire when you are ready to go; or you can bring the “fillings” and let everyone assemble the cones as they choose there by your campfire and then wrap and cook. You essentially create your own custom candy bar! Allow each camper to design their cone with the fillers of choice in layers. Wrap securely with foil and place over heat near campfire or on grill to allow the chocolates to melt. Unwrap and enjoy.